Informal economic activities across much of sub-Saharan Africa provide crucial cash income and employment for both rural and urban populations. Governing the informal economy is recognised as a key policy challenge due to its contribution to local livelihoods and its common association with illegality, tax evasion and negative environmental impacts. In addition, because of the increasingly globalised trade in commodities, parts of the informal economy can also be supported by global sources of capital. 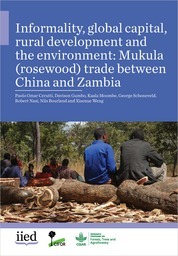 This report focuses on the international mukula (or rosewood) trade in Zambia, interrogating the role of global capital (in particular that of Chinese origin) and its impacts on rural livelihoods and the environment. 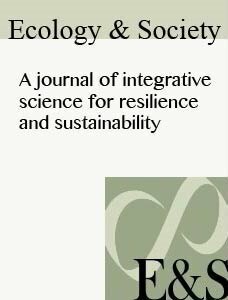 We find that rural villagers are increasingly forging direct links with foreign investors, producing innovative business models that accelerate the rate of small-scale production and extraction of resources. This ‘globalised’ rural informal economy urgently calls for innovative policies, which maximise the benefits of global capital flowing directly to rural populations, while minimising the negative impacts associated with the environment, revenue losses and resource governance. Authors: Cerutti, P.O. ; Gumbo, D.; Moombe, K.; Schoneveld, G.C. ; Nasi, R.; Bourland, N.; Weng, X.